MOREEN MITCHELL University Director of Employer and Alumni Engagement AMY ROTHENBERG Brooklyn Campus Director of Employer and Alumni Engagement JOAN YONKE Post Campus Director of Employer and Alumni Engagement Stay connected! Visit LIUalumni.com or email liualumni@ liu.edu to share class notes and news or update your alumni profile, address, and/or contact information. Copyright © 2018 by LIU. All rights reserved. Long Island University is committed to exceeding student expectations and predicting which fields will see the greatest future demand and innovation. Investment in perfecting robust academic programs provides our students with access to some of the world’s best faculty and current thinking, while positioning them to step out of the classroom well prepared for a rewarding career. New talent is joining LIU Pharmacy and driving cutting edge research in pharmacogenetics and systems pharmacology. Dr. Jeffrey Idle, a global leader in precision medicine, joins faculty who are championing the discovery of nextgeneration pharmaceutics. When fully approved and accredited, the new College of Veterinary Medicine will be only the fourth such college in the Northeast. 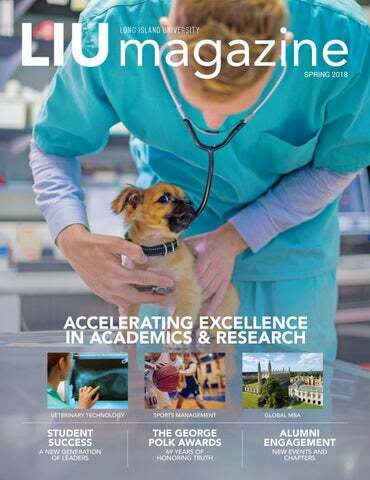 Partnerships with programs already on campus and through prominent alumni will make LIU a leader in veterinary medicine and care. These are just two of the exciting areas where LIU is accelerating excellence and offering our students a unique experience. Dr. Sturtz is looking forward to this September when her classes begin. “We’re not going to have our own animals here,” she explained. “We’ll be working with models and an animal mannequin. It breathes. It has a heartbeat. You can take its ‘blood.’ It allows students to get comfortable with their skills before they treat a living patient.” This program is on track to offer a range of externships from small clinics and hospitals that see cats and dogs to multi-species facilities. “We’re already engaged to be working with the North Shore Animal League,” said Dr. Sturtz. “I think that’s going to be a very fruitful relationship.” In addition to the Veterinary Technology Program, which is already established, the new LIU Post College of Veterinary Medicine (CVM) is seeking accreditation by the Council on Education (COE) of the American Veterinary Medical Association. The request for a comprehensive site visit was granted for August 2018. The first step in the accreditation process is the issuing of a Letter of Reasonable Assurance, once the COE determines that the CVM will meet all eleven standards of accreditation. Right now LIU students hoping to become veterinarians have to leave the Island to pursue their doctorates elsewhere but someday LIU hopes to join the 30 other vet schools in the country by establishing its own college of veterinary medicine on the Post campus, pending approval. Speaking of close ties to four-legged species, LIU Post is known for its highly regarded North Shore Equestrian Center, Marjorie Merriweather Post’s original stables. Besides boarding horses, the facility hosts riding classes and horse shows, and is the home of LIU’s championship NCAA women’s varsity equestrian team, which competes locally and nationally. Since 2014, LIU Post has been offering an Equine Studies minor, a two-year program that had 14 students enrolled in 2017. A champion equestrian competitor, Gerald Chasin (Brooklyn '65, BS), who runs the center, has long been an avid proponent of this academic offering for those majoring in business, marketing, accounting, and advertising, for example. "There’s a thousand different companies involved in the equestrian world,” said Chasin, an institutional consultant, senior vice president and managing director at UBS, adding that there are some 30,000 horses just in the Long Island area alone. Among those LIU graduates with an abiding love of horses is Valerie Angeli (Post '85, BA), who taught beginning riding lessons at Chasin’s center as she pursued her major in communications. She also brought along her own show horse— known as Preference, Preffy for short— to college. EQUUS Foundation founder Lynn Coakley, second from left, and Valerie Angeli, second from right, join ladies from the Equine Rescue and Adoption Foundation of Palm City, Fla., at a recent event in the Sunshine State. “I used to walk around with him on the Great Lawn, which wasn’t encouraged,” Angeli recalled with a laugh. “One of the highlights of my college experience was having horses all around me and beautiful trails to ride on. I knew how lucky I was.” Angeli joined the EQUUS Foundation in 2017 as vice president of communications and special projects following a 25-year career at the ASPCA. “We applaud the efforts of LIU to expand their equine studies programs, promote horse welfare, and encourage students to get involved in our programs and our events that are helping horses in every way,” said Angeli. Alumni Valerie Angeli, EQUUS Foundation’s vice president of communications, has long had an abiding love of horses. She brought her own show horse to the campus at LIU Post and boarded him at the stables. “We focus on horses when their sports careers are over,” said Lynn Coakley, EQUUS Foundation founder and president. “America's horses need homes where they can flourish not only as athletes, but also as companions, teachers, and especially healers. We are dedicated to safeguarding the comfort and dignity of horses throughout their lives and sharing their ability to empower, teach and heal with as many people as possible, especially people with special needs.” In addition to supporting equine charities across the United States, the EQUUS Foundation Equine Education Network provides an online resource of educational institutions with equine studies programs, including veterinary schools, as well as collegiate riding programs. Riders from near and far come to demonstrate their skills at the North Shore Equestrian Center, the home of LIU Post’s championship NCAA women’s varsity equestrian team and the host of horse shows and riding competitions. “The more job opportunities there are within the equine community, the more jobs there will be for horses,” Coakley said. Bryan, who coaches the LIU Pioneers varsity football team. “If I was watching a game with Bryan, it took about two minutes for him to remind me how little I knew about football,” he said with a laugh. Drawing on his vast experience in sports marketing and advertising, Collins is the CEO of an innovative experiential hospitality firm, On Location Experiences, which the NFL originally set up to focus on hosting VIP packages for the Super Bowl. Under his leadership, the mission has grown exponentially, and so has the revenue: from $35 million to $600 million today. Collins’ advice for sports management majors is simple. “Be as well-rounded as you can be in the core business fundamentals,” he said. And LIU’s expanding sports management program will make sure that happens. Maria Perez of The Naples Daily News shared the award for exposing the practice of Florida companies hiring undocumented workers in dangerous jobs to avoid compensating them when injured, in some cases by arranging their deportation. Antonia Farzan and Joseph Flaherty of Phoenix New Times also won for revealing that Motel 6 motels in Phoenix, Arizona, provided nightly guest rosters to ICE agents investigating undocumented immigrants. The announcement of the 69th Annual Polk Awards were aired live on C-SPAN, which included a special panel discussion featuring top reporters discussing the role of the press. Elevating one of the most prestigious awards in journalism, Long Island University (LIU) held a nationally televised event at the National Press Club in Washington, D.C., to announce the winners of the 69th Annual George Polk Awards. The event continues the University’s long-standing tradition of honoring and celebrating the impact of courageous and authentic journalism on our national and global discourse. SPECIAL AWARD The staff of The New York Times and the staff of The Washington Post for revealing ties between Trump campaign officials and Kremlin-connected Russians that gave rise to the Mueller investigation. The event included opening remarks by LIU President Kimberly Cline and a special panel discussion on the role of the press moderated by The Washington Post media columnist Margaret Sullivan and featuring top national correspondents Greg Miller of the Washington Post and Michael S. Schmidt of The New York Times. “There is an interesting dichotomy between information and truth,” President Cline said. “With smart phones and social media, we have never had more access to information. And yet, truth is more elusive than ever. The Polk Awards honor truth." LOCAL REPORTING AWARD Melissa Segura of BuzzFeed for drawing attention to innocent men framed for murder by a Chicago police detective with stories that led to their release from prison. NATIONAL REPORTING AWARD Jodi Kantor and Megan Twohey of The New York Times and Ronan Farrow of The New Yorker for exposing the decades-long sexual predation of the movie producer Harvey Weinstein and the campaign to cover it up. John Darnton, curator of the Polk Awards and recipient of two Polk Awards and a Pulitzer Prize for his work with The New York Times, announces the winners of the 69th Annual Polk Awards. POLITICAL REPORTING AWARD Alice Crites, Stephanie McCrummen and Beth Reinhard of The Washington Post for digging into the past of U.S. Senate candidate Roy Moore of Alabama to disclose on-the-record accounts of sexual assault upon a 14-year-old girl and his pursuit of other teenage girls. Adam Dean and Tomas Munita of The New York Times for capturing the plight of the Rohingya people desperately fleeing burning villages in Myanmar and pouring into woefully ill-equipped refugee camps in Bangladesh. The International Consortium of Investigative Journalists for mining a trove of 13.4 million records to reveal how corporate giants and prominent wealthy individuals use financial manipulations to evade taxes. Long Island University President Dr. Kimberly Cline joins members of a special panel discussion on the role of the press. L to R: President Cline, Greg Miller of The Washington Post, Margaret Sullivan, The Washington Post media columnist, and Michael S. Schmidt of The New York Times. NATIONAL TELEVISION REPORTING AWARD Elle Reeve of VICE News for her on-thescene up-close coverage of the protests in Charlottesville, Virginia, that probed the motivations and tactics of the white nationalist leaders behind the rally. FOREIGN TELEVISION REPORTING AWARD Nima Elbagir and Raja Razek of CNN for uncovering a hidden modern-day slave auction of African refugees in Libya. COMMENTARY AWARD Gail Collins of The New York Times for her columns of satiric wit and neighborly wisdom that probe the oddities of American politics and social mores, skewering public figures on all sides of the aisle with equal-opportunity zest. MEDICAL REPORTING AWARD Nina Martin of ProPublica and Renee Montagne of NPR for explaining the reasons and portraying the tragedies behind an alarming increase in maternal deaths in pregnancy and delivery in the United States. Iona Craig of The Intercept for documenting the destruction and civilian casualties of a covert U.S. Navy SEAL raid on a remote village in Yemen. Ben Taub of The New Yorker for showing the humanitarian devastation caused by the shrinkage of Lake Chad in Africa and underlining the connection of the ecological disaster to famine and armed uprising. David Begnaud of CBS News for capturing the destructive power Hurricane Maria unleashed on Puerto Rico in September and documenting how limited aid from the federal and territorial governments delayed the island’s recovery. LIU BROOKLYN PHYSICAL THERAPY PROGRAM RANKS IN THE TOP 10 Brooklyn’s Physical Therapy program was recently ranked in the top 10 nationally by Schools.com based on criteria using several factors including affordability, flexibility and student success. Schools.com uses robust data on colleges and universities around the U.S. published by The National Center for Education Statistics (NCES) to gather for their rankings. LIU Post’s was named one of The Princeton Review’s Green Colleges for 2016-2017. The schools that made the Top Green Colleges list share superb sustainability practices, a strong foundation in sustainability education, and a healthy quality of life for students on campus. The Top Green Colleges for 2017 were chosen based on a combination of school-reported data and student opinion, collected via surveys. LIU INDUCTED AS 344TH CHAPTER OF PHI KAPPA PHI LIU has been inducted as the 344th chapter of Phi Kappa Phi, the second oldest honor society in the United States, admitting the top 10 percent of students from all majors and colleges. This prestigious organization has many benefits, among which are generous undergraduate and graduate scholarships. LIU WINS NATIONAL RECOGNITION FROM ELITE PHI THETA KAPPA SOCIETY LIU Transfer Admissions and Enrollment Services Offices at LIU Post and LIU Brooklyn have won national recognition for the second consecutive year by the elite Phi Theta Kappa (PTK) international transfer honor society. LIU will be honored at PTK’s national convention in Kansas City, Missouri on April 19-21, 2018. 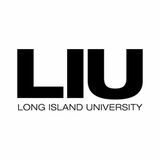 We are honored that our partners at Nassau Community College provided the external endorsement for LIU this year. LIU Post’s focus on experiential learning and world-class faculty was recognized with two Best of Long Island Awards. The University was voted as Best College or University and LIU President Dr. Kimberly Cline was voted as Best College President in the 13th annual Bethpage Best of Long Island competition. The popular contest drew more than 907,000 online votes from nearly 85,000 registered voters. One of the world’s top collections of privately owned contemporary art—now housed in a 45,000-square-foot space in Miami, Florida, and slated to move to much larger digs next year—began very humbly more than half a century ago in a Manhattan apartment on 8th Avenue and 23rd Street. Mera Rubell was then taking night classes at LIU Brooklyn to get her master’s degree in education ('68, MSE). On weekends she would take long walks in Chelsea with her husband Don Rubell, who was in medical school, and they noticed that artists were converting abandoned storefronts into art space. Increasingly curious, they ventured inside. LIU Brooklyn Alum Gerald Yass Endows Scholarship for Accounting Majors For Gerald Yass (Brooklyn ’51, BS), the subway was his campus. “That was my study hall,” he said recently, recalling that he rode the train an hour from the Bronx to go to college where he got his degree in accountancy and went on to a very successful career. Now, with a gift of $1 million from the Susquehanna Foundation, a charity he set up with his son Jeffrey, he has established the Gerald Yass Endowed Scholarship to be awarded annually, based on merit and need, to two undergraduate students majoring in accounting on either the Post or Brooklyn campus. “My motivation is simple,” explained Yass, a certified public accountant. “I want two young kids to have the same break that I had.” His parents hardly spoke English, and neither his brother nor his sister ever went to college. “My father sat behind a sewing machine for 50 years in the garment district, and I knew I wasn’t going to do that,” he said. After he graduated, he worked for a year, earning $25 a week, doing bookkeeping. Then in 1951 he was drafted and served in the Army Finance Corps during the Korean War. In the meantime, he’d married his childhood sweetheart, Sybil, who was at his bar mitzvah. They went on to have a daughter, Carole, and Jeffrey, and five grandchildren. Following his military service, he worked at Eisner & Lubin, a mid-size accounting firm in Manhattan. Some LIU graduates may like to say they’ve got stars in their eyes, but only Dr. Richard Maurer (Brooklyn ’64, BS) could claim that his work has literally brought the far horizon of our solar system into view—from Mercury to Pluto and beyond. dish. Either way, Julie makes it constantly and never tires of it. Julie discovered how to meld her passion for cooking with her love for television at LIU Post where she studied communications and played Division II ﬁeld hockey. She was drawn to LIU due to its proximity to Manhattan, while still being in the suburbs like she was used to growing up in upstate New York. “It hit all of those marks for me. It just all came together. The Brookville area and the campus is so beautiful.” Her overall favorite memories were the television classes and studio experiences, writing and producing, which led directly to her success crafting her PBS shows. “I lived in the studio. I absolutely loved my professors. Jean Carlomusto gave me a pin I still have that says, ‘Don’t Watch Televison, Make Television.’” For those looking to be cookbook authors or to produce their own television shows the way Julie does, she has this advice: Be authentic, one million percent. Be true to yourself and your vision and your voice. Believe that what you’re doing is worth it and that others will hopefully embrace your work. And you have to put in the work. And be nice to everyone along the way. Just be thankful and grateful. A New Era for Alumni Engagement 2017 marked the beginning of a new era for LIU Alumni engagement. Leading into the new academic year, the Alumni Relations office and the Employer Relations team merged to form a more comprehensive structure in line with national best practices: Employer & Alumni Engagement. The new organizational structure allowed staff to continue to engage alumni while also increasing employment opportunities for our students. Three national admissions and alumni recruiters were hired to increase alumni engagement in California, Texas, and the Southeast. impact our U.S. News & World Report rankings. In turn, this increases the value of your LIU degree, and positively affects our ability to attract and retain exceptional faculty and staff and students. We are delighted to be reconnecting with a community of alumni who are proud of their LIU degrees and eager to credit the University with their success. These successes are not only a testament to their own student experiences with the University but also a testament to the work we are doing to engage them on how to advance future generations of LIU graduates. NEW RESEARCH FOR DEVELOPING NEW THERAPEUTICS TO CONTROL PAIN WITHOUT DETRIMENTAL SIDE-EFFECTS Dr. Grace Rossi, Professor of Psychology at LIU, and her colleagues at Sloan Kettering Cancer Center are investigating alternative splicing mechanisms and functions of the OPRM1 gene by specifically decoding molecular mechanisms in mu opioid actions. Mu opioid receptors play a fundamental role in mediating the actions of morphine and most clinical analgesics, as well as drugs of abuse, such as heroin. The mu opioid receptor gene undergoes extensive alternative pre-mRNA splicing, that is conserved from humans to animals but dysregulation of several variant mRNA expressions has been observed in a number of animal models, as well as human diseases. Evidence from their knockout mouse model suggests that splicing plays a distinct role in various morphine actions, including tolerance, physical dependence, and reward. Dr. Rossi and her colleagues have the potential to generate significant molecular insights into the mechanism and function of OPRM1 gene, and have the potential for developing new therapeutics for controlling pain and alleviating the detrimental side-effects of mu opioids. professionals, become more involved in their child’s school, and encourage their children to become more independent learners. STATISTICALLY-BASED PHARMACEUTICAL QUALITY STANDARDS FDA PROJECT The Lachman Institute is leading a grant with the FDA and Purdue University to develop a statistical and analytical strategy to more accurately determine drug product quality. The three-year, $2,000,000 grant uses advanced statistical tools and analytical methods to assess the variability in key tablet properties including how fast they dissolve and the uniformity of the amount of drug in each tablet. The project examines a range of products from many companies with the goal of modernizing industry guidance to accelerate the time to market and to help control drug prices. The project is led by Drs. Morris and Dave at LIU, Dr. Reklaitis at Purdue, and coordinated by Dr. Qing Cai (pictured above) with her team of six LIU graduate students. PFEIFFER GRANT TO PROVIDE SCHOLARSHIPS AND FELLOWSHIPS FOR LIU PHARMACY LIU received $1,000,000 over five years to expand and improve the PharmD program at the LIU Arnold and Marie Schwartz College of Pharmacy (LIU Pharmacy). A grant from the Gustavus and Louise Pfeiffer Foundation has provided scholarship funding to current and incoming highperforming, low-income students. This will also allow LIU to implement a new PharmD post-graduate fellowship program with the goal of elevating the quality of the LIU Pharmacy PharmD student body and improve pharmacy education and training. GLOBAL INSTITUTE AT LIU Chaired by former Congressman Steve Israel, the Global Institute at LIU has become our region’s premier platform for understanding a world that’s increasingly volatile, uncertain and complex. Through the Global Institute, top global leaders including former President Bill Clinton, former Secretary of State Colin Powell, and former Vice President Joe Biden have come to LIU to discuss global affairs. LIU has partnered with celebrated philanthropist T. Denny Sanford, who was named by The Chronicle of Philanthropy as one of America’s 50 most generous donors, on several initiatives: Sanford Innovation: Mr. Sanford made a $5 million commitment to LIU, which has opened an incubator in conjunction with the START-UP New York program, and provides scholarship support for our University to produce the next generation of great entrepreneurs. Sanford Philanthropy: The Sanford Institute of Philanthropy at LIU is preparing nonprofit leaders for the 21st Century and helping to dramatically increase the impact of charitable donations and institutions. Sanford Education: Through the LIU-Sanford partnership, we have delivered programs that have helped more than 200,000 students and inspired more than 1,000 teachers. THE STEVEN S. HORNSTEIN CENTER FOR POLICY, POLLING AND ANALYSIS The Hornstein Center is raising Long Island University’s national profile through its innovative polling and timely topics. From elected official approval ratings to national opinions on infrastructure, the Hornstein Center is quickly becoming a source for newspapers and broadcast outlets across the country. Recent polls have included the aforementioned surveys on President Trump’s approval ratings, opinions on the state of the country’s infrastructure, reactions to the State of the Union, and a series of questions on current events topics. The data gathered by the Hornstein Center has been cited in news reports across the country and in outlets as prestigious as The Washington Post and National Public Radio. Hornstein Polls are being featured in some of America’s most prestigious news outlets. Philanthropist T. Denny Sanford was presented with a proclamation from Mayor Bill De Blasio declaring February 27, 2018 as Sanford Harmony Day in New York City. has become an exciting and integral part of the experience at LIU Global. Josephine Bourne, a freshman that represented both the Democratic People’s Republic of Korea and The Elders, shared her excitement by hanging images of Kim Jong Un up as she spoke. She said that the model UN "provided us all with an opportunity to learn about current events, implement what we had learned about global governance institutions, and use problem-solving skills to hypothetically create real solutions.” Days before the conference all 18 students experienced the vibrant marketplace and thrift stores in Heredia, Costa Rica, looking for blazers and button ups. Dressed in their “new” suits they planned lunches and meetings, to discuss their proposals and plans for their assigned nations. Students participating in LIU Global’s Costa Rica program turned themselves into temporary ambassadors from countries around the world as they dealt with pressing international issues at a Model UN conference. “All global companies—KMPG, Unilever, the big banks—are now confronted with the issue of sustainability,” said Sajdik. “Companies understand that if they continue to use resources in an uncontrolled manner, very soon they will have less resources.” And since he was in Cambridge, Sajdik also addressed the ramifications of Britain’s decision to exit the European Union (“Brexit”). “I thought it was important to give them some insight on this issue from the European perspective,” Sajdik said. His students met the Austrian Commercial Counsellor in London, Christian Kesberg, who explained how the EU benefits the economies of small countries on the continent like his. The LIU Global MBA program provides a unique perspective on the world’s economy. These students study at the College of Management at LIU Post, Cavendish College at Cambridge University, and the School of Management at Fudan University. Not only do they become familiar with the business climate in New York, London, and Shanghai, they meet some of the leading experts on the most important student issues. Among those lending their expertise to this special academic program is Ambassador Martin Sajdik, who conducted a one-week intensive course in Cambridge on how multinational firms operate in developing countries with an emphasis on sustainability. Long Island University is on the forefront of the genomics revolution. Dr. Jeffrey Idle is leading the new Systems Pharmacology and Pharmacogenomics Division. disease, and liver and lung disorders, among others. The building block of precision medicine is the study of genomes. Dr. Jeffrey Idle is a world leader in the ﬁelds of metabolomics and pharmacogenetics. Dr. Idle’s work in this ﬁeld and in pharmacogenetics has been instrumental in moving therapeutics towards more patient-speciﬁc treatments (“precision medicine”) in a broad range of medical specialties. In addition, metabolomics has been successful in the discovery and deﬁnition of biomarkers of disease susceptibility and outcome, for example, in various types of cancer patients. A genome is the complete set of DNA of an organism. Therefore, the human genome is all the genetic information in the DNA that has been used to produce and to operate a human being. Each of us has a unique genome, with the exception of identical twins, who share a common genome. The human genome comprises approximately 3 billion so-called “base pairs” arranged into units called genes, each of which has particular biological functions. We have somewhere between 20,000 and 25,000 individual genes and, despite the Human Genome Project, the exact number is still uncertain. Fulbright Scholars Expanding Our Network of International Students LIU is exceedingly proud of the growing network of international students choosing to come from near and far to study at our campuses. That network includes Asma Khadhraoui, a Tunisia native, here on a Fulbright scholarship to earn her masters degree in accounting at LIU Post. Asma grew up in Kairouan, a centuriesold city and designated UNESCO World Heritage Site. As Tunisia rebuilds from the recent revolution, Asma seeks to use her accounting degree in the service of her country and become a leader in implementing sensible financial and economic practices. She has a great interest in putting her knowledge and skills to use for humanitarian purposes and dreams of one day working for the United Nations. Arriving in a new country and attending a new school was intimidating, but Asma’s fears were allayed the moment she met Dr. Robert Valli, Dean of the College of Management. As she began to excel in class, she also took on projects for the College including an assignment to manage a group of nine LIU students, six Cambridge professors and a former UN ambassador participating in the summer Global MBA program at the University of Cambridge. Asma said, “My life at LIU Post was the best experience that one can ever dream of, definitely one of a kind. I’m grateful to be at a school that values youthful energy and the innovative contributions that the students can bring.” She credits much of her experience to the College of Management community that welcomed her, not only as a student but as a family member. Through her relationship with Dean Valli, Asma was introduced to LIU Post Alum, and University Trustee Thomas M. Buonaiuto, President and CEO of Empire Bank. Asma was hired by Empire Bank for one year, as allowed by the Fulbright Program, in order to apply her new knowledge. In this role, Asma says that she is “learning something new every day and continuing [her] self-enrichment journey.” As she journeys forward, Asma reflected, “No matter where this life might take me next, I will never forget the family that I have had in the College of Management. They are role models to look up to and have had an impact in shaping the person I am today and also the person I will be tomorrow.” Asma will graduate this May with a 3.9 GPA. Pioneers Field Hockey Winning in Academics and on the Field Excelling in academics and athletics is the mark of a Pioneer and the field hockey team exemplifies this ideal. The team was named as one of 27 Division II Teams to earn the Zag Field Hockey/NFHCA Academic Team Award (3.0+ GPA as a team) and was named the fifth-best performing team in Division II this year (3.59 GPA for the fall). They had another outstanding season on the turf this fall, returning to the Division II National Championship for the second consecutive season and the fourth time in five years. Madison Murchack is Providing a Blanket of Comfort to Veterans with PTSD Madison Murchak (Riverhead '19), who is pursuing a Master’s degree in Homeland Security and Counterterrorism at the Homeland Security and Terrorism Institute of LIU Riverhead, has found a unique way to provide comfort to veterans suffering from PTSD, stress, anxiety and depression. Starting in Pittsburgh in 2015, Madison launched Fleece Connection, a non-profit group that distributes specially weighted fleece blankets to recovering troops and veterans in VA hospitals throughout the U.S. Fleece Connection blankets are handmade by volunteers at workshops. After graduation, Murchak hopes to become a counterterrorism analyst. She attributes her dedication to all the men and women she has met through Fleece Connection. Junior Emily Miller, a psychology major, led the Green and Gold offensively with 40 goals, ranking second in the country in goals per game. Senior Kaycee Zelkovsky, who earned a 3.94 GPA in the fall, is a General Business and English dual major, and was just named a Zag Field Hockey/National Field Hockey Coaches Association Scholar of Distinction, and freshman Sammy Bell, a Foresnsic Science major, led the team with 13 assists, ranking third in Division II in assists per game. The Pioneers captured the Northeast-10 title after outscoring opponents 16-6 during three games in the tournament, defeating Assumption College 4-1 in the championship game. The team entered the NCAA Tournament with an 18-3 record and defeated Millersville University 3-0 in the semifinals before falling 4-1 to Shippensburg University in the title game. Julia Raie Lands Internship and Full-Time Position at EY Julia Raie (Post '18) enrolled in LIU Post’s School of Professional Accountancy—part of its prestigious College of Management—because of its established network with the Big Four accounting firms. Excelling in her studies, Raie approached her Accountancy professor Dr. Jeffrey Hoops, a former partner at Ernst and Young, for an internship opportunity with the prestigious corporation. Dr. Hoops connected Raie with key associates who facilitated the challenging entry into this exclusive program. Today, Raie has her BS in Accountancy, and she is forging ahead through LIU’s accelerated Global MBA program with a coveted internship experience and a full-time position awaiting her at esteemed Ernst & Young. instead of a software algorithm to accomplish great advances. And with so many biotech companies located in close proximity of our Brooklyn campus, there are tremendous synergistic opportunities,” Troudt said. “Primarily, The Brooklyn InnoSeq is focusing on three projects,” Fan explains. The first is a Genomic Innovation Sequencing Core Facility that will work internally with the School of Pharmacy. The second project is a biotechnology Contract Research Organization (CRO) staffed by a team of experienced scientists and entrepreneurs that will potentially be funded by NSF - National Science Foundation (IGE) Program, to support LIU Brooklyn’s biology students with hands-on machine learning genomic technique and classroom/online bioinformatics training. Nini Fan was honored with the Brooklyn Nets and NY Islanders young female entrepreneur award on March 21 at Barclay Center. The third project, The Brooklyn InnoSeq, will promote its service through highresolution techniques while spontaneously outsourcing start-ups and organizations in the community, to connect the academic and biotech industry. Nini was honored with the Brooklyn Nets and New York Islanders young female entrepreneur award this March at Barclays Center. Nini Fan conducting research involving DNA sequencing, immunology and developmental biology in her LIU Brooklyn lab. President of the Pharmacy Student Leadership Council, the College’s student government, Joseph is active in a number of other professional organizations, including Phi Delta Chi Pharmacy Fraternity and the American Pharmacists Association and Phi Lambda Sigma, the Pharmacy Leadership Society. Born and raised in Hong Kong, Joseph works parttime as a pharmacy intern at Maimonides Medical Center in Brooklyn and is considering pursing a PGY-1 residency program after graduation and a career as a clinical pharmacist. Yoldine is president of the College’s chapter of Lambda Kappa Sigma International Women's Pharmacy Fraternity and is a managing editor of The Pharmacy Newsletter, the student print and online newsletter. Yoldine works part-time as a pharmacy intern at Montefiore Medical Center and plans a career in the pharmaceutical industry. Benjamin’s work toward his doctorate includes assisting Dr. Grazia Stagni with her FDA-sponsored research on microdialysis, which improves the availability of topical treatments. He serves as chair of LIU Pharmacy’s student chapter of the American Association of Pharmaceutical Scientists, and as graduate hall director in LIU Brooklyn’s 490 Fulton Apartments. “I enjoy attending LIU Pharmacy because it has so much to oﬀer,” Benjamin said, “and because graduate students and undergraduates can interact daily." for the College of Management. of her stay at LIU Post. Nicole has a lot on her agenda. The LIU Brooklyn men’s basketball team made their name known on a national stage this winter, winning the Northeast Conference tournament and earning a bid in the NCAA National Championship tournament. The Blackbirds, seeded No. 4 heading into the NEC’s post-season tournament, beat St. Francis Brooklyn, Fairleigh Dickinson and top-seeded Wagner en route to the program’s sixth NEC title, and first since 2013. Senior Joel Hernandez was named NEC Tournament MVP, after leading LIU with 32 points and seven rebounds in the championship game. BLACKBIRDS SOAR TO NEW ACADEMIC HEIGHTS The LIU Brooklyn athletic department had a landmark semester in the Fall of 2017. The 19 combined teams finished the semester with a 3.4 department GPA, the highest EVER in department history! The top five teams were men’s golf (3.85 team GPA), defending NEC champions women’s tennis (3.80), two-time NEC champions women’s volleyball (3.68), the No. 13 nationally-ranked bowling team (3.62), and field hockey (3.6). Additionally, the Blackbird women’s swimming team earned College Swimming Coaches Association of America (CSCAA) Scholar All-America Team honors, and over 55 fall student athletes were named to the NEC Fall Academic and Commissioners’ Honor Roll. WOMEN’S BASKETBALL MAKES WAVES WITH PLAYOFF APPEARANCE The LIU Brooklyn women’s basketball team secured its place in the postseason by winning the final two games of the season. There, the No. 6 seeded Blackbirds continued to make noise. In the quarterfinals, LIU upset No. 3 seed and borough rival St. Francis Brooklyn, 59-56, to advance to the semifinals. LIU's win was the program's 15th in NEC Tournament play, and first since 2010. WOMEN’S INDOOR TRACK & FIELD EARNS RECORD SEVENTH NEC CHAMPIONSHIP TITLE The LIU Brooklyn women’s track and field team earned their record seventh Northeast Conference (NEC) Indoor Championship team title–and first since 2011–on February 17. Three different Blackbirds–junior Shantae McDonald, sophomore Taylor Parker and junior Eugenie Hue– combined for four gold medals and two NEC championship meet records. LIU Post Pioneers women’s basketball Head Coach Deirdre Moore was named East Coast Conference Coach of the Year after leading the Pioneers to 22 regular season wins. Following an eighth-place finish in the East Coast Conference during the 2016-17 season, women’s basketball head coach Deirdre Moore turned the Pioneers into true contenders in the East Region this year. LIU Post doubled its win total from a year ago, capturing 22 victories for the sixth 20-win season in program history. The Pioneers compiled a 17-1 ECC record, capturing the conference regular season championship and earning the No. 1 overall seed in the ECC Tournament. Despite a loss in the conference semifinals, the Pioneers secured an at-large bid to the NCAA Division II Tournament. TRACK AND FIELD CAPTURES FIVE TITLES AT ECC CHAMPIONSHIP An impressive indoor track and field season was capped off with five individual titles at the East Coast Conference Championships on February 23. LACROSSE TEAMS RECEIVING ATTENTION ON THE NATIONAL STAGE Entering the season as the No. 5 team in the nation, the women’s lacrosse team suffered two losses to nationally ranked opponents to slip to No. 8/12 during the week three rankings but bounced back with a huge victory against No. 6/7 University of New Haven on March 13. Despite beginning the season ranked in just one national poll, the men’s lacrosse team defeated local rival and No. 4/5 Adelphi University on its home turf for the first time in a decade on February 24. The Pioneers found themselves ranked No. 13/15 during the week three rankings on March 12. CALDERONE SHINES AT NCAA WRESTLING CHAMPIONSHIPS Senior Joe Calderone had an excellent season on the mats for LIU Post, compiling a 32-9 record for the season after missing time a year ago due to injury. Following a 26-5 mark during the regular season, Calderone entered the NCAA Division II Super Region I ranked third at 141 pounds. After a loss in the semifinals, Calderone finished in fourth-place to earn a bid to the NCAA Championships along with sophomore teammate Anthony Sparacio. This book provides a comprehensive focus on systemic, societal, and organizational functioning in a variety of contexts in advancing the interdisciplinary fields of human development, psychology, counseling, social work, education, public health, multiculturalism/ cultural studies, and organizational consultation. This is the life story of a man who has learned to confront and subdue the anger and sorrow he feels over the ongoing tragedy of our country’s racial politics. Schooled in the ethics and techniques of the civil rights era, Rev. Dr. Paul Smith is a translator between estranged people, a courageous healer of hatred, a man of God whose ministry knows no bounds. LIU Post’s distinguished Writer-in-Residence, former Congressman Steve Israel, teaches a course in Politics, Media, and Culture and is soon releasing a timely new novel, Big Guns. After 16 years in Congress, including six in the House Leadership, Congressman Israel takes students inside the political world and its intersection with media and culture, part of LIU’s commitment toward Writing Across the Curriculum. Israel is following his best-selling debut novel The Global War on Morris with Big Guns on April 17. Released by Simon & Schuster, advanced reviews are universal in their praise of his sophomore effort which is a satire of the gun lobby based on Congressman Israel’s keen wit and insider take on Capitol Hill. Stephen Saunders, RD, presents a compelling and sometimes controversial argument in favor of animal liberation. Drawing on historical examples of human oppression and comparing them to the plight of animals, Saunders reveals the hypocrisy of those who fight for human rights while ignoring speciesism. (NYU Press) John Ehrenberg analyzes both the usefulness and the limitations of civil society and maps the political and theoretical evolution of the concept and its employment in academic and public discourse. From Aristotle and the Enlightenment philosophers to Black Lives Matter and the Occupy movement, Ehrenberg provides an indispensable analysis of the possibilities of what this increasingly important idea can, and cannot, offer to contemporary political affairs. With the countries of Southeast Asia increasingly challenged by a plethora of nontraditional security issues—climate change, food and water security, infectious diseases, and migration key among them. The authors explore the factors that continue to impede cooperation in combating transnational security threats across the region. Join us as we celebrate the 50th Reunion of the Class of 1968 and all graduating classes ending in 3 and 8. 6:00 p.m., The Plaza Hotel President Kimberly R. Cline and the Board of Trustees of LIU cordially invite you to a special evening honoring Winnie Mack, RN, Senior Vice President, Health Systems Operations at Northwell Health. LIU Subway Series : New York Yankees at New York Mets Please join us for our 4th Annual Subway Series Alumni Outing. LIU alumni seats are located on the Field Level in the Baseline Box, Section 106. liualumni@liu.edu or (718) 780-6562 community.liu.edu/2018subwayseries Deadline: Thursday, May 31st at 11:59 p.m. The LIU Post Department of Athletics is pleased to announce the 37th Annual Post Pioneer Golf Outing. **Time subject to change according to MLB regulations. Tell us your story! Share your personal milestones and professional accomplishments with the LIU community. Visit liu.edu/alumni/submit to send your story. Check our website at liu.edu/alumni for the most up-to-date alumni information, news, and events. Jon Denni Jensen (Brooklyn ’66, Business Management, Management Accounting) is a retired certified treasury professional. James Webber (Post ’72, BA in History and Education) is a retired AT&T senior account manager. Ralph Gelper (LIU Pharmacy ‘53, BS) is retired after working in the health department in Broward County, FL. Previously he owned and operated several pharmacies. Dr. Charles Jay Malemud (Brooklyn ‘66, BS in Biology) is a scientist and professor of medicine and anatomy. His laboratory studies the role of altered signal transduction in auto-immune diseases and osteoarthritis. Dr. Malemud was awarded his PhD from George Washington University in 1973. After completing his postdoctoral research fellowship at the State University of New York at Stony Brook in 1977, he joined the faculty of medicine at Case Western Reserve University in Cleveland, OH. Andrew Mitchell Silver (Global ’72, BA in International Studies) is an ombudsman mediator for federal and divorce with a master's-level specialization in conflict resolution and multi-cultural sensitivity. Andrew is also a stand-up comedian and has experience negotiating with bullies and tyrants. Robert B. Busch (Brooklyn ’56, BS in Health Education) is a retired teacher. Former vice president, Yonkers Federation of Teachers, basketball coach, and tennis coach, winning 11 City of Yonkers JV basketball titles. Benedict A Robbins (LIU Pharmacy ’66, MS) is retired. He is a U.S. Navy Korean War veteran. He has held various management positions at Teva Pharmaceuticals and taught retail management at Columbia University College of Pharmacy. Phyllis Cohnstein Sandow (Brooklyn ’58, BS in Education) is a Real Estate agent. Previously she worked as a teacher, fashion designer, interior designer, and a traffic reporter. Dr. Ronald F. Roberts (Brooklyn ’67, MS in Chemistry) is a retired R&D scientist and manager. Samuel Lossos (LIU Pharmacy ‘50, BS) is a retired physician. Practiced as a registered pharmacist after LIU and went on to receive a DO degree from the College of Osteopathic Medicine and Surgery in Des Moines, Iowa, in 1960 and a MD degree from U.C. Irvine in 1962. Practiced as a family physician for 30 years in CA. Dr. John Imperio (Brooklyn ’60, BS Pre-Med) is a hematologist and an oncologist. John was recognized as 2017 top doctor in Staten Island, NY, and received the President of the United States’ Volunteer Service Award from President Barack Obama. Alan Malachowsky (Pharmacy ’61, BS, MS) is a retired doctor. Howard Schwach (Post ’62, BA in History) has had a novel published: “Flight 587 Down: A Novel of Terrorism and Betrayal.” Previously he’s had several books for school children published. Dr. Peter Socrates Caffentzis (Brooklyn ’62, BA, ’64, MS) is a court-appointed family mediator. He went on to obtain his PhD in Social Psychology in 1971. Peter has held positions as a family therapist, executive outplacement counselor, and outplacement counselor. Brian Berenbach (Brooklyn ’65, BS in Chemistry) is a retired engineer. Brian teaches as an adjunct in the Georgia Tech Research Institute Expert Systems Engineering Professional course. He recently contributed a chapter to the textbook “Modeling and Simulation in the Systems Engineering Life Cycle." Dr. Charles S. Isaacs (Brooklyn ’67, BS in Mathematics) is president of Real Estate Services for Non-Profits. He received his MA in Social Theory from the New School for Social Research, his PhD in Community Development from Union Institute & University, and is the author of “Inside Ocean HillBrownsville: A Teacher's Education." Robert S. Steinberg (Brooklyn ’67, BS in Accounting) is a tax attorney and CPA. In January 2018, Robert published, “Tax Effects of the Dissolution of Marriage.” Marvin Lesman (Brooklyn ’68, BS in Business Finance) is a consultant and contrarian. William D. Barry (Post ’68, BA in Social Science and Economics) is a realtor and licensed real estate sales agent. Mike Dobise (Post ’69, BS in Accounting) is a retired CPA. Monte O. Fisher (Global ’70) is executive director of non-profit organization Achungo. He is also director of care and recovery at Menlo Park Presbyterian Church. Dr. Raymond Goellner (LIU Pharmacy ’71, BS, MS, and PharmD) is a retired pharmacist and chief of clinical services and a pharmacy director. Joseph G. Trotto (LIU Pharmacy ’74, BS Pharmacy) is a pharmacist. George Wesley Williams (Southampton ’76, BA in Business) is a retired systems analyst. Theodora Emily Karczewski (Post ’76, MA in Speech Pathology) is a retired speech pathologist. Tony Favia (Brooklyn ‘77, BA in Journalism) recently joined Envolve as a product manager, where he is responsible for developing and launching new products. Kim Howard Robinson (Global ’78, BA in International Relations/Biological Sciences) is an Aviation ESL/EFL Aviation English Research Specialist. Miranda Gatewood (Southampton ’79, BFA in Fine Arts) is an exhibiting artist, photographer, editor, networking magazine owner, and owner of Seatuck Communications. Miranda holds an MFA in fine art photography from the Cranbrook Academy of Art, Bloomfield Hills, Michigan. Her photographs have been collected by the Erie Art Museum in Erie, Penn. Her national juried exhibitions of selected works include: “Long Island Biennial 2014." Dr. John P. Belardo (Brooklyn ’81, Pre-Med) is medical director and surgeon at the Advanced Laser and Cataract Center. Antonio Marcano (Brooklyn ’81) is a communications specialist and associate director of communications and media. Larry Selkow (LIU Pharmacy ’82, BS RPh) is a pharmacist. A. Maynard (Brooklyn ‘83, BS, MBA in Accounting) is an insurance agent. Christina Marie Sala (DiCostanzo) (Post ‘86, BS in Accounting) is a stay-at-home mom. Previously, she worked at KPMG Peat Marwick, Philip Morris, and for private investigative firms. a family. Previously, she worked for CUNY as direct loan coordinator before she moved to Florida and worked for GE Healthcare as an IT program manager for 13 years. Frank Pomata (Post ‘86, BA in Political Science) is a county employee as a Suffolk Labor Technician with the Suffolk Works Experience Program. Previously he worked in higher education (Student Affairs), which led to a job at the NYS Governor's Office for Voluntary Service, and from there he held a series of jobs at various nonprofit/human service agencies. Dr. Susan Mosher (Edwards) (Southampton ’96, MS in Elementary Education) is an educational consultant. She graduated from the University of New England with a doctorate in educational leadership in December 2016. Aurora Workman (Post ’87, BA in Education) is a college administrator as the assistant director for Equity, Inclusion and Affirmative Action. She was recently elected president of the Nassau Community College Alumni Association, where she made history as the first African American to be elected to this position. She is host of “Lion Tales" on FM radio 90.3 WHPC, which streams all over the country on iHeartRadio.com. Wayne M. Schuster (Post ’88, MS in Music Education) is a K-12 music education teacher and a musician. Wayne started teaching in Jericho in 1988. He took the year off in 1990-91 to tour with Blood, Sweat, and Tears. Jericho rehired him for 1991-92, and he has now been teaching there 26 years. He directs the 4th and 5th grade bands at Jackson Elementary School, and the 6th grade band at Jericho Middle School. His 5th grade bands have earned “gold" ratings at NYSSMA Majors for the past four years. Wayne freelances as a tenor saxophonist and clarinet player. Susan Elizabeth McNicholas (Conway) (Post ‘88, BA in Communications) is a real estate salesperson. Tara Jean Fardella (Dever) (Post ’97, BS and MS in Health Administration/Public Administration) is a senior consultant. Susan Rubenstein DeMasi (Post ’98, MS in Library Science) is a media librarian at Suffolk County Community College. Susan wrote the first biography on Henry Alsberg, a writer and human rights pioneer of the early 20th century, titled “Henry Alsberg: The Driving Force of the New Deal Federal Writers Project.” Dr. John Peter Petrone (Southampton ‘99, BA in History/Political Science) is the principal at Gustine High School. During his career he has received the following awards: 2018 Association of California School Administrators State Finalist Secondary School Principal of the Year; 2018 Association of California School Administrators Region IX Secondary School Principal of the Year; California Future Farmers of America (FFA) Outstanding Public-School Administrator, 2017, 2016, 2015 (gold award), 2014, 2013 (silver award); Gustine High School Teacher of the Year 2008; Drexel University Sacramento Leadership Fellowship Award; and the Drexel University Constantine Papadakis Public Service Fellowship. He received his Doctor of Education, Educational Leadership and Management; Education Policy concentration from Drexel University in 2015 after earning his Master of Arts, Educational Leadership and Administration from Chapman University in Orange, CA in 2009.
was in investment banking, and travels the world. His advice to current students of LIU is: “You have a unique opportunity at an amazing institution with a rich history and tradition. Be proud and excited to be part of the LIU family.” Tamika Butler (Post ‘06, BFA in Arts Management, Minor in Film) is a school administrator at Montessori Day School of Brooklyn since 2011. Sandra Dee Barron (Cave-Barron) (Brooklyn ‘07, MPA in Public Administration) is an IT manager of procurement. Jessica Ivette Robles-Maisonet (Robles) (Brooklyn ’07, MBA in Business Administration, Minor in Human Resource Management) is a senior specialist at the Office of the Ombudsman. Hicham Laazaazia (Brooklyn ’08, MBA in Finance) is head of relationship management. Lindsey Block (Post ’08, BS in Childhood Education) is a personal trainer. Ahu Meto (Post ’09, MBA) is trade marketing manager at GSK Consumer Healthcare in Turkey. Previously, Ahu was in marketing at Proctor & Gamble. GIVE A GIFT & GET A GIFT FULFILL A DREAM. FOSTER A FUTURE. A portion of every item sold beneﬁts the LIU Post or LIU Brooklyn student scholarship program. New York State Council on the Arts with the support of Governor Anrew M. Cuomo and the New York State Legislature.